HomeAway, Inc. is the world’s leading online marketplace for the vacation rental industry. In 2014, HomeAway’s marketing team was looking to expand its capacity for executing global ad-hoc campaigns. The company created a new Marketing Operations team led by Bob Martin, Global Director, to implement Eloqua and bring campaign execution in-house. HomeAway needed campaign execution support to keep up with an increasing number of global marketing team requests for ad hoc email campaigns. DemandGen helped HomeAway optimize the production process in Eloqua and establish a new model for campaign execution support. 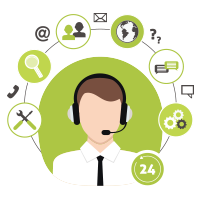 Marketing now submits requests and provides the campaign assets through an internal ticketing system, and DemandGen executes the logic flow and manages the end-to-end campaign process. Once the campaign is executed, his team reports the important KPI metrics, such as open rates and a heat map of what calls to action get the most clicks. Additionally, DemandGen provides Campaign Execution Services for all of HomeAway’s global ad hoc campaigns. 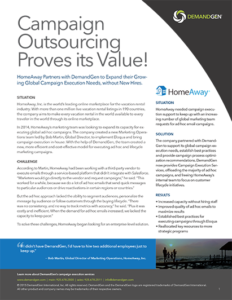 Bringing the global campaign execution in-house using Eloqua has improved efficiency and lowered costs, while enabling HomeAway to execute more email campaigns than previously possible. 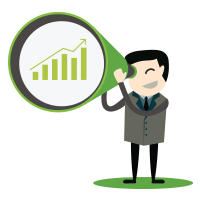 And, with DemandGen handling ad hoc campaign blasts, Martin’s team has more time to target and nurture specific audiences through the demand funnel with multi-touch campaigns.